For weeks I asked my daughter what kind of cake she wanted for her ninth birthday. I was ecstatic when she chose our chocolate truffle cake. Not only because I love giving into my chocoholic cravings as I devour it, but because I know how it’s going to turn out after making it several times. The weekend before her birthday, she had her bestie over in a pre-party playdate to make tie dye shirts. 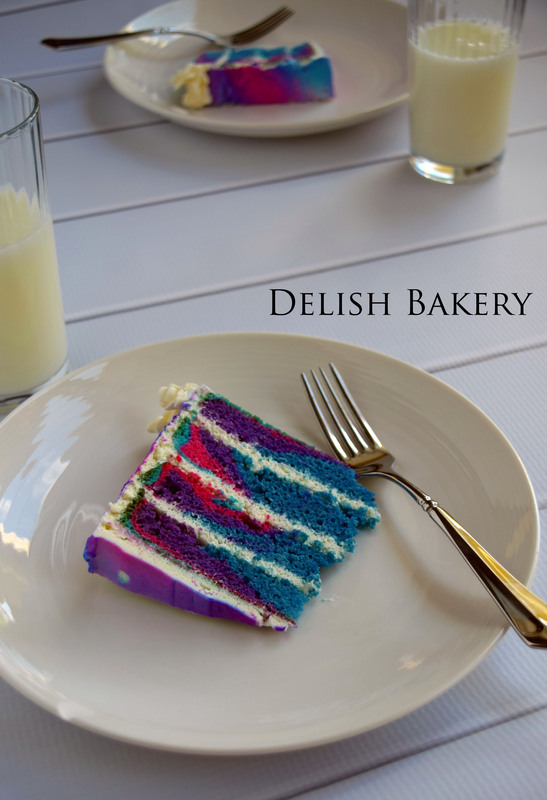 The swirl of colors inspired her for a new cake idea. She wanted a tie dye cake. In the same colors as her shirt. And she wanted the colors IN the cake too. At first I flinched. I mentally went through the reasons why it didn’t make sense. I considered trying to convince her into sticking with the chocolate plan. But after looking into those wondrous blue eyes glowing with creativity, there was no way I could say no. The outside was covered in a white whipped cream frosting. I airbrushed the color to mimic her shirt at her instruction. She told me what color went where to make sure it was just perfect. However, I surprised her with the inside. The vanilla cake grabbed on to each color. (Warning: don’t mix the colors once in the pan or you will run the risk of a grayish mess.) The big reveal didn’t happen until she blew out the candles and we cut into the cake. She couldn’t believe it. She wanted me to take pieces to everyone in the neighborhood so they could her cake. While I would’ve preferred the colors to be more evenly distributed in the cake, the designer told me she was very happy with her masterpiece. Why wait for your birthday? 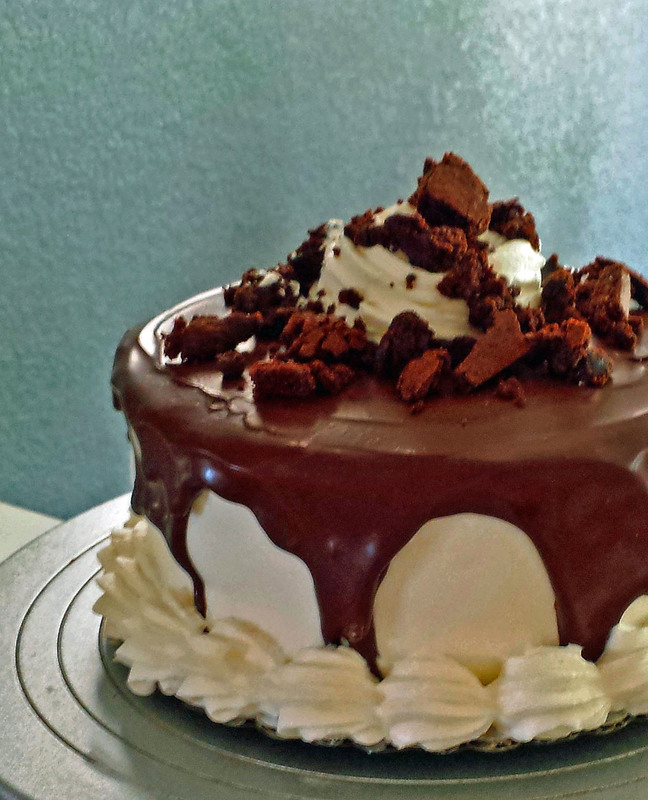 It’s time to treat yourself to ice cream and cake. Here’s a fun way to combine both of your favorites to make a pretty incredible summer-time treat. 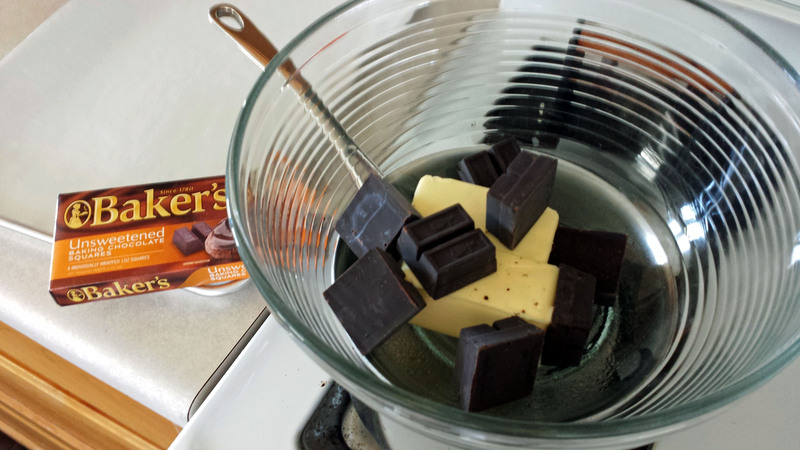 Start with making your favorite brownie recipe. (I know it’s not really cake, but you’ll still be happy in the end.) I went from scratch, but you could use a box mix to simplify the process. You could…but it might not be as delish. 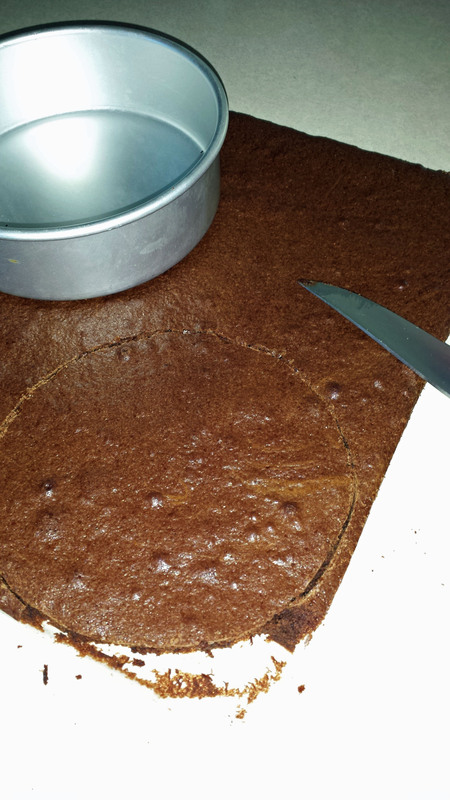 Bake the brownies in a cookie sheet so you have enough space to cut out three 6 inch circles. Don’t worry about those extra brownie bits. They’re going to get you through as you wait for this to be ready. Line your 6 inch pans with plastic wrap and dump in your favorite ice cream about 1 inch thick. This is where you can let your creativity and tastes shine. 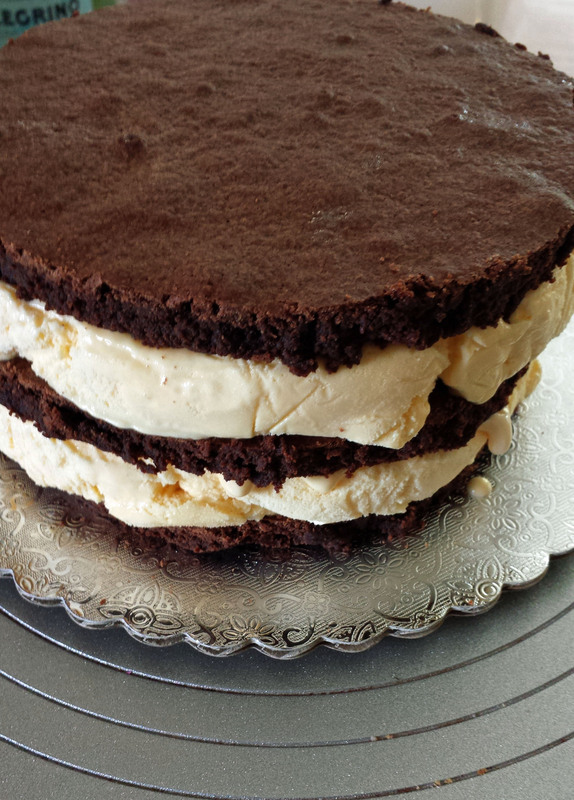 You could do coffee ice cream for a mocha cake. How about cookies ‘n cream for a cold Oreo? Or even mint chip for the ultimate Thin Mint. Do this for two layers and put it in the freezer until it sets up. I stacked them on top of each other in the same cake pan because I’m kinda lazy at times. I hate washing more than I have to. After the layers are set, start assembling. Once put together, put back in the freezer to have it set up. The ice cream melts fast so your movements need to be swift. Do yourself a favor and plan better than I did. Let it sit overnight to harden. This will save you slipping time later. It’s time to whip up some whipped cream frosting and pile it on. Whipped cream frosting is super easy. Pour in heavy whipping cream. I could say a cup, but I usually overdo it. How can you have too much whipped cream. So go for two cups. Add 1/2 cup sugar in your two cups. Then let it whip slowly and for a longer time period. 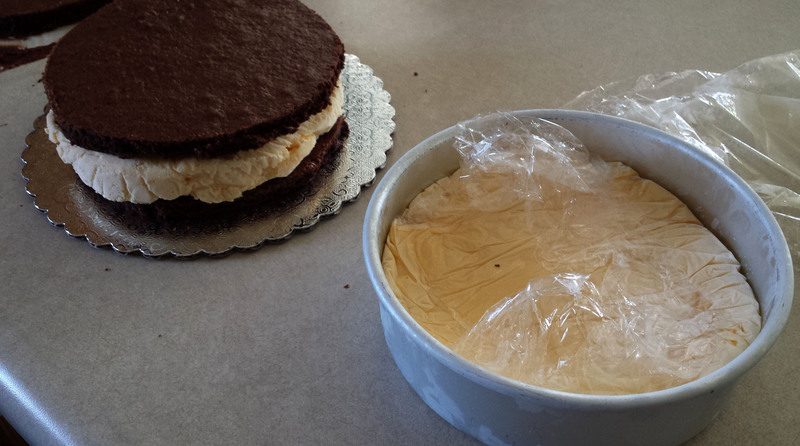 This helps from making big bubbles in the frosting which can deflate later. You can spread it with a spoon to give a homemade feel. Go ahead and eat a couple spoonfuls. Or pile it up on some fresh strawberries to reward yourself. Aren’t you glad you made extra? I can’t tell you how delicious this was. 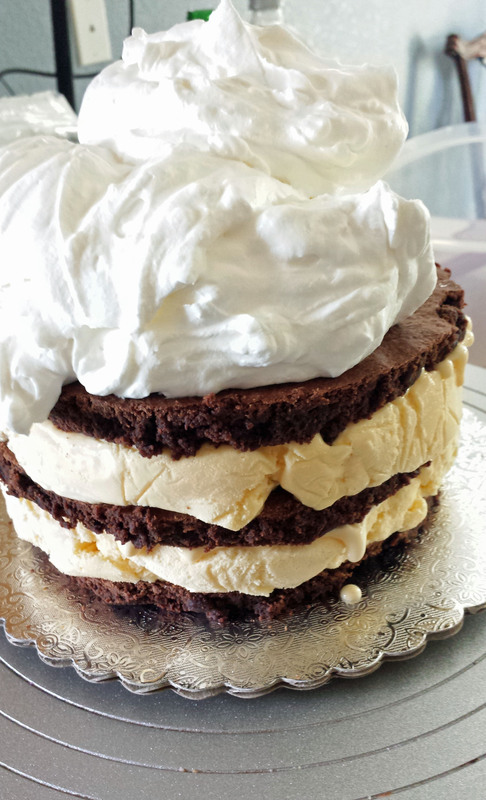 It’s the perfect combination to meet all your dessert wants. I could have eaten all the parts separate but it was so much more enjoyable all mixed together. Every baker knows the “it” ingredient in decorating is fondant. It’s smooth surfaces and pristine cuts make the most amazing creations. Throw in some gum paste, molding chocolate, or marzipan and you have the most realistic visuals in edible form. While they look beautiful, they lack taste. Most people make a face when you talk about eating fondant. This is not the face we want when someone eats a Delish cake. 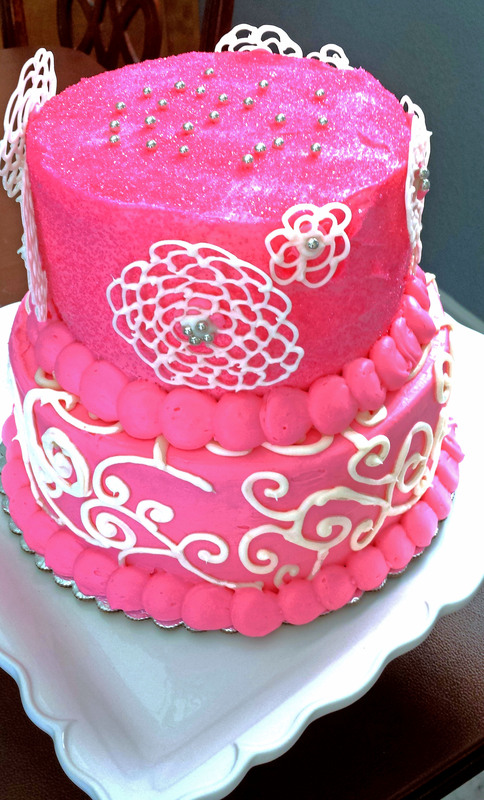 What’s a baker to do if you don’t decorate in fondant but you want beautiful cakes? You have to get a little more creative. 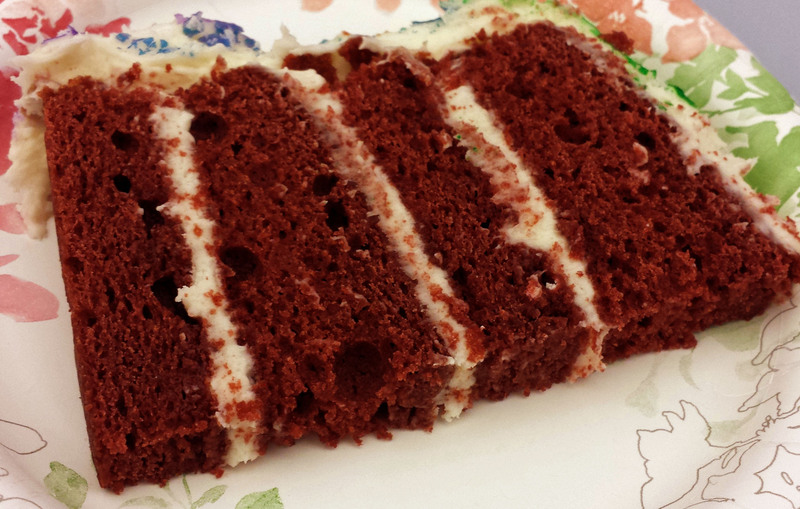 We’ve chosen to use delicious things to adorn our cakes. There are lots of ways to give a unique look to your cake without covering it in something your guests will scrape off. 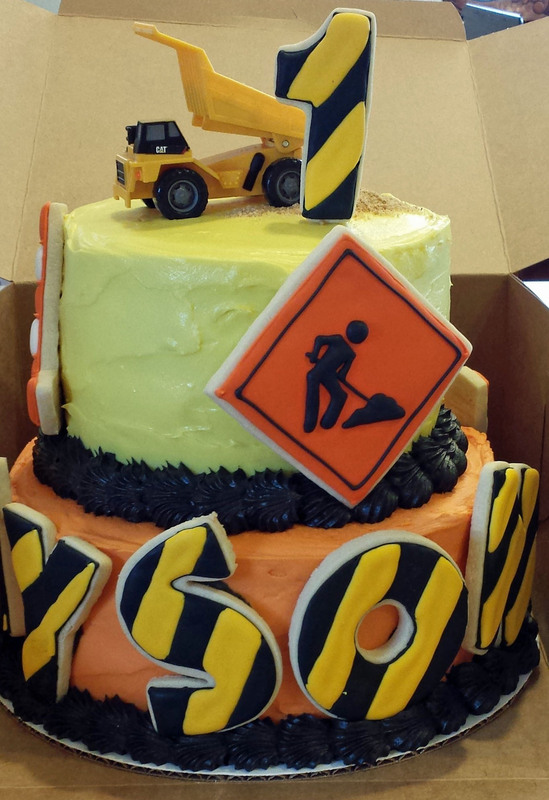 We feel your cake should taste just as good as it looks. Don’t you agree? 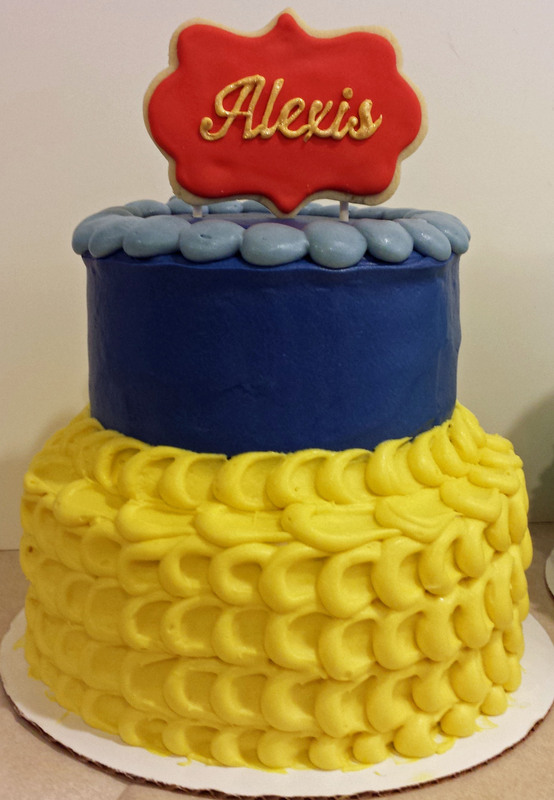 Let us know some of your favorite non-fondant cake designs in the comment section. The Airborne Toxic Event has some pretty devout fans all over the world. I’ve been able to meet a few in person during my concert travels last year and others I’ve gotten to know over emails and chats. A lovely lady, Colleen, wrote me out of the blue one day with the title “We’re twinsies!” And we’ve ended up talking about TATE, writing, and the never ending questions around doubt ever since. Colleen has shared how TATE helped her move through tragic sadness when her first son passed. The beautifully written and strikingly painful piece is shared on her blog, These Stunning Ruins. The experience weaves TATE’s music throughout her moving forward and then into to her exciting news this year when she discovered she was pregnant again. With only a few weeks to go before her newborn son makes his debut, it only seems fitting to throw her an Airborne Toxic Event themed virtual baby shower. Several other fans with many talents have put together some things to celebrate Colleen and Andy’s new addition while paying homage to the music that helped them get there. Here are their links so you can check out the other awesome things created in Colleen’s honor. 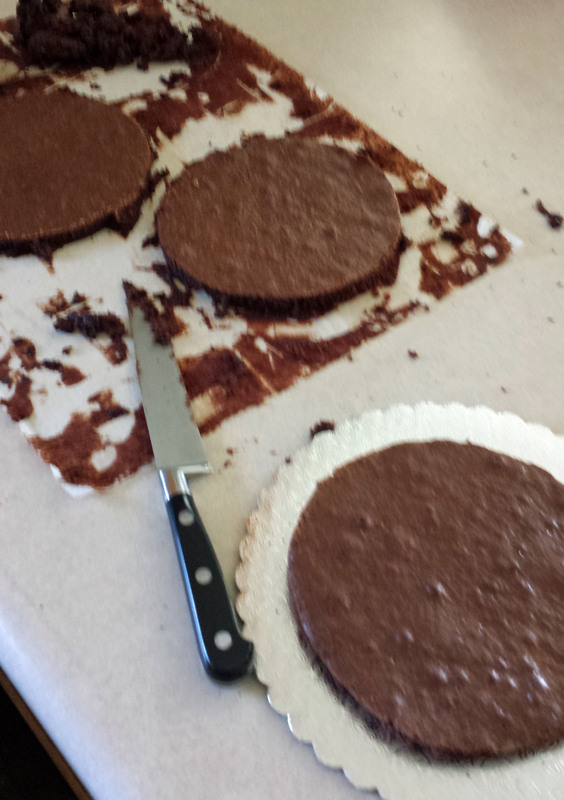 Of course I wanted to do the cake. Inspired by the band’s albums, I created a three-tiered cake highlighting their three releases. 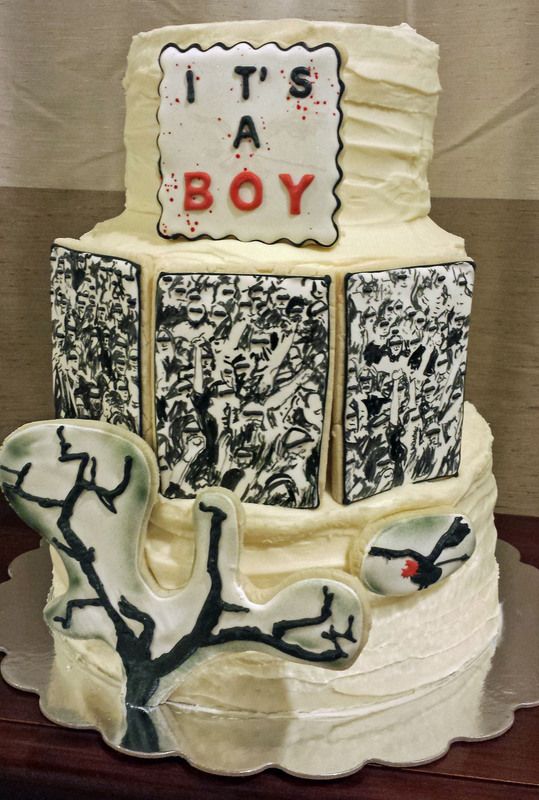 Each layer is decorated with cookies to showcase their album covers. At the top is their most recent album Such Hot Blood renamed for our guest of honor with “It’s A Boy.” When I took a hard look at the cover to make sure I got the red splatter in the right place, I realized the bird icon is faintly seen in the background. 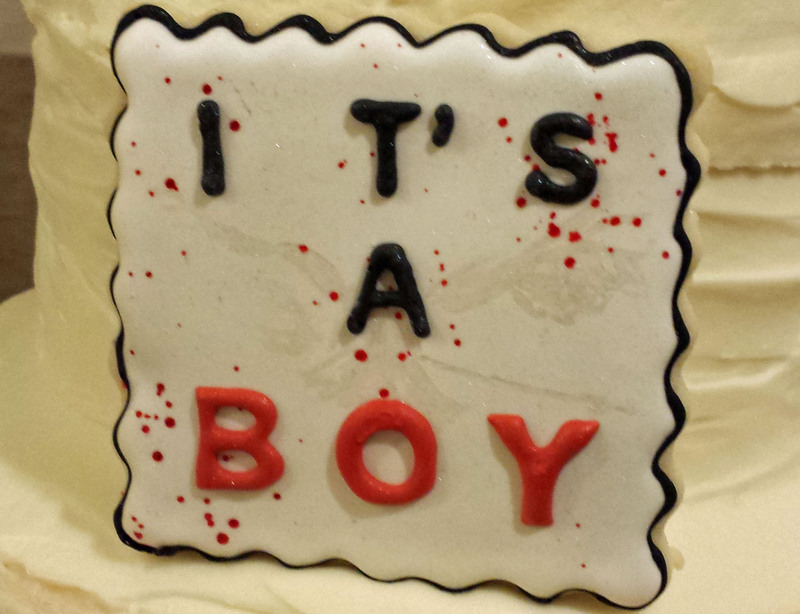 After a bit of panic, I managed to incorporate it onto the cookie. I hope you can see it because that became one of my favorite elements. 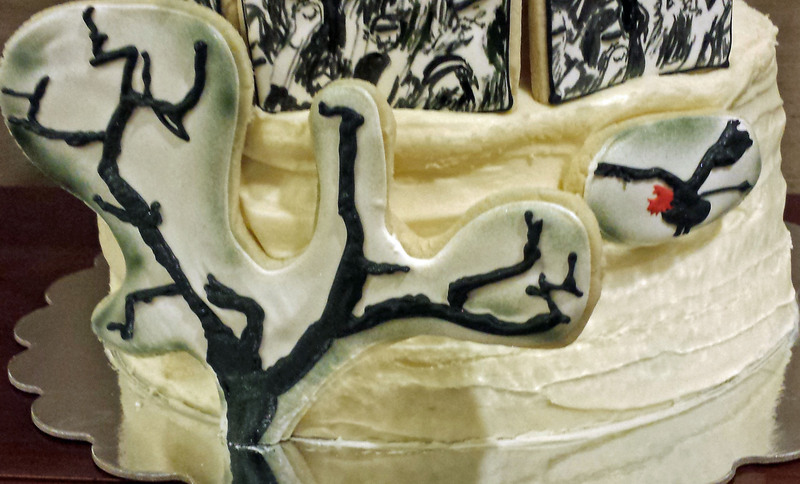 The second layer is three painted cookies mimicking the people on the All I Ever Wanted album. Since I have ZERO artistic ability, this part was pretty painful. You’re worth it Colleen. 😉 Let’s hope you can tell they’re people. If you’re still not sure, check out the band’s album cover to see what I was going for. Lastly the bottom layer holds up their debut album. I wanted to get it just right since it was the album that introduced us all to the band. I airbrushed the cookies edges to give the dark shadowing from the album’s cover and I tried to put every branch in the right place. I hope it captures the moment where this all started. Others may wonder why in the heck I would make such a thing for a baby shower. “Where’s the baby blue blocks and ribboned rattles?” I’m sorry people, this mom is way more rock and roll than that. Hopefully TATE fans will get it. 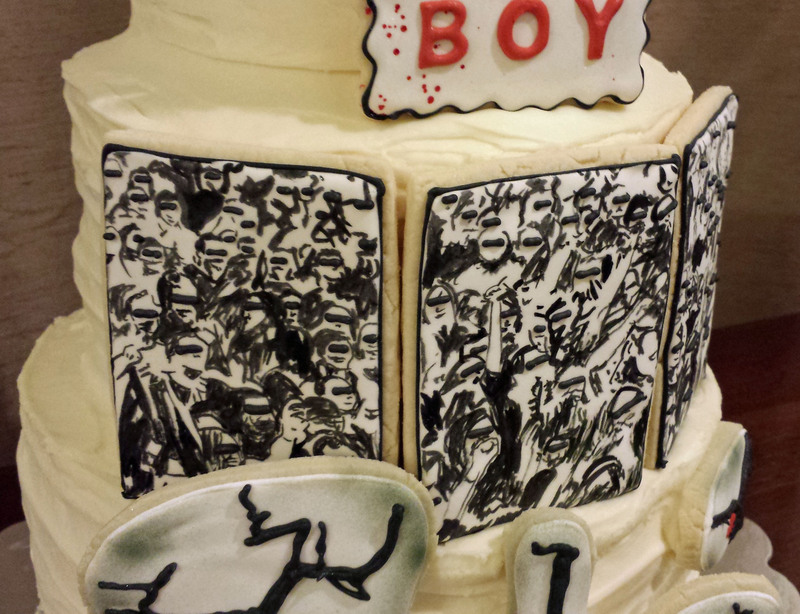 But when it comes down to it, there’s only one person this cake is for. This is for a mother who built wonderful things out of her stunning ruins and hopefully will have all she’s ever wanted. Congrats Colleen and Andy! Here’s a piece for you. Fiftieth birthdays seemed to pop up all at once. 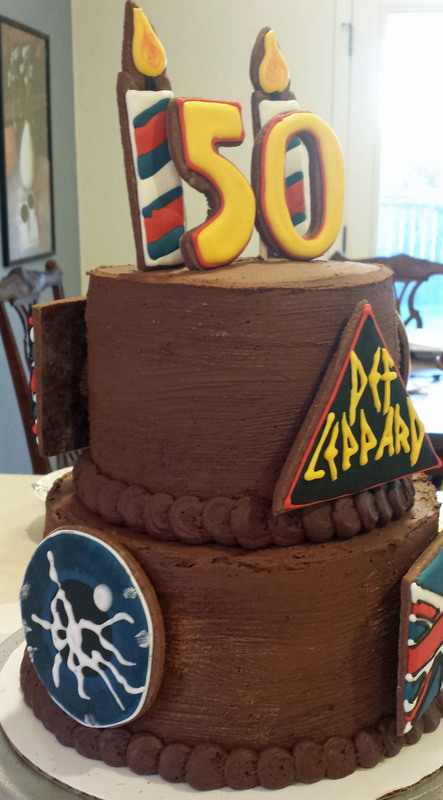 One pretty fun request was for a Def Leppard themed cake. 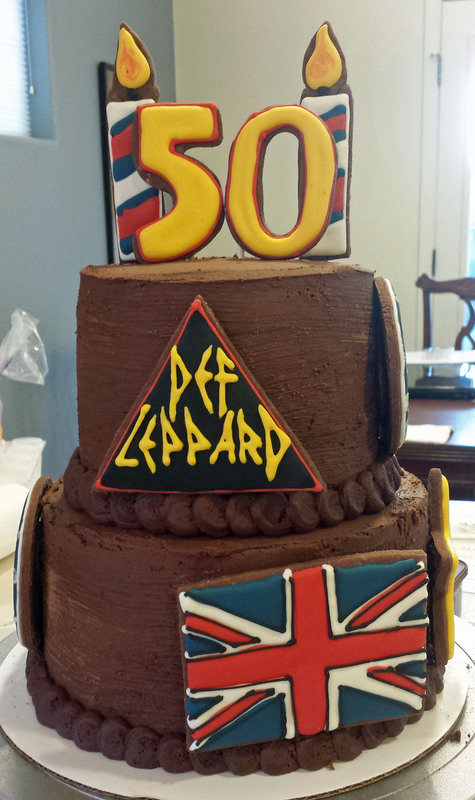 While I was not a hair band fan, I love anything that mixes baked goods and music. There was definitely enough sugar poured on this and the birthday girl loved it. As college football season comes to an end, I wanted to share a cake I made for a friend this season. 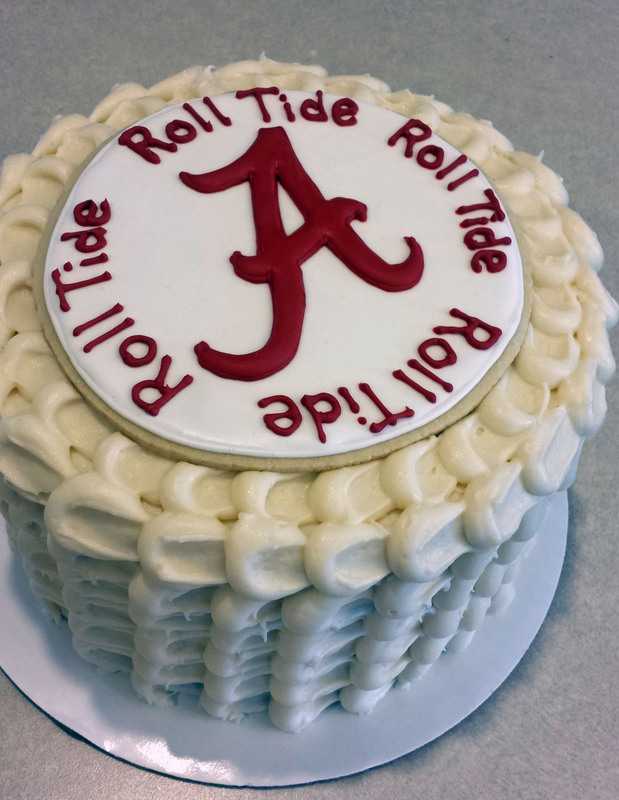 She asked for a red velvet cake supporting her Alabama team. I’d never even heard “Roll Tide” until she put in the request. Remember in Oregon, it’s usually only the Ducks and Beavers you hear about. After a quick Google search I was able to find their logo. Here’s a little taste of Alabama to change things up in Oregon country. 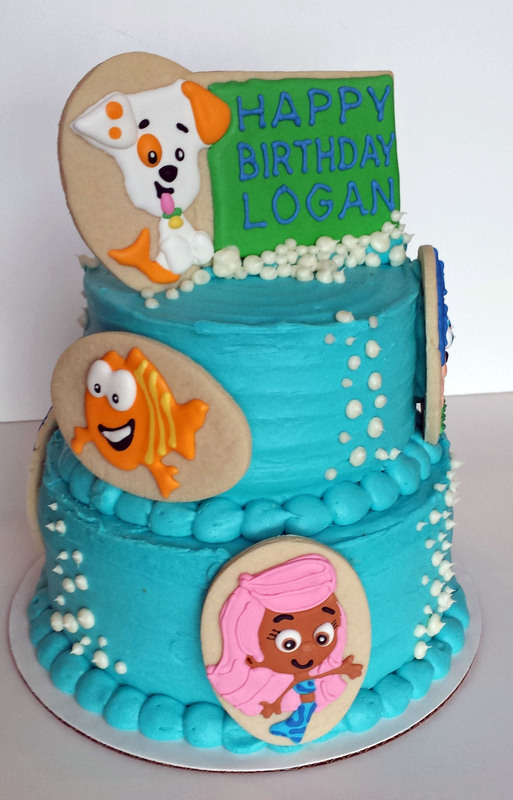 Since my children have grown out of the toddler television, The Bubble Guppies were strangers to me until a client requested them for a cake. I had to research how these half-fish and half-people with a catchy theme song had caught the attention of everyone under the age of five. 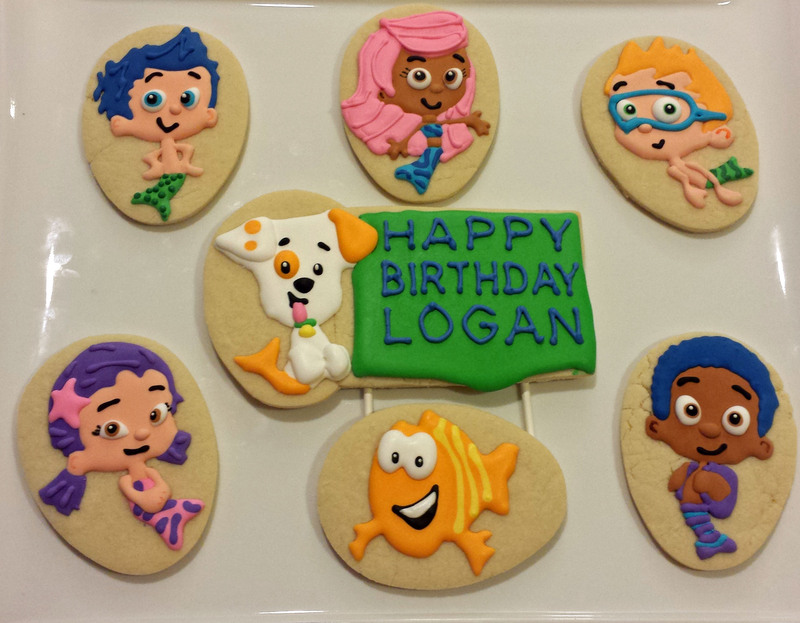 Later, I will show you an easier version to these cookie characters. Is tiramisu even an italian dessert? I’m not sure. I base this opinion on my Olive Garden experiences, which is pretty sad. A simple Google search could solve this mystery. 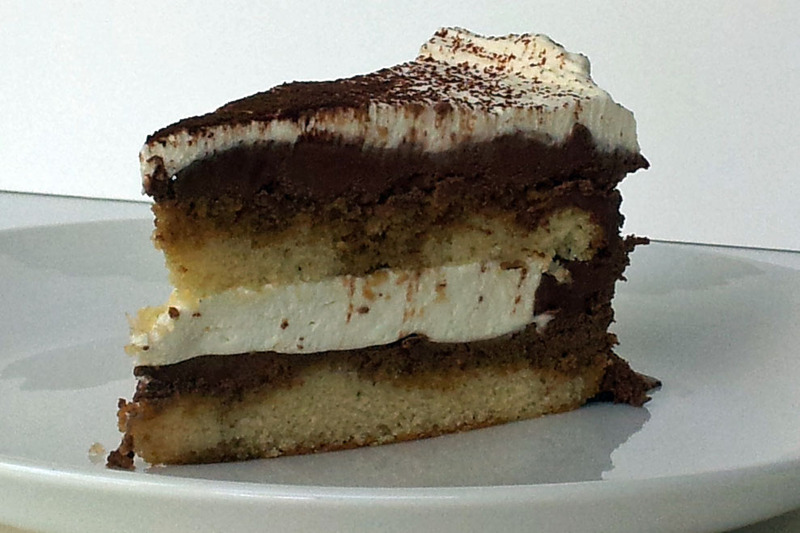 Instead, I’m diving in to share a slice of this italian delight. I looked for tiramisu recipe for a long time after trying Sweet Life’s version couple year ago. 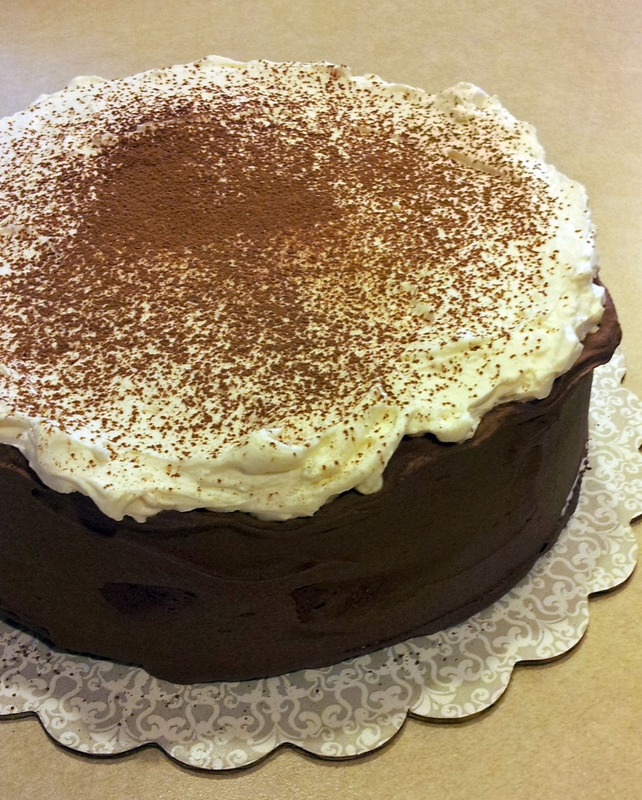 They have a great tiramisu cake. For mine, I wanted something balanced between coffee soaked cake without being a soggy mess. The filling needed a light marscapone texture while still giving the same comfort as the creamy custard in the traditional tiramisu. And of course the whole thing had to have chocolate. Lots of chocolate. Last week we celebrated a birthday in my house. My daughter turned 8 years old. Like every year, she gets to pick what kind of cake she would like. This year she wanted ice cream. After getting over the shock from my daughter asking for a non-baked cake, we came to the understanding she did was some actual cake in the creation too. And she wanted real ice cream, not the Dairy Queen cake which has no actual cake in it. We collaborated to make her the dream cake. Kit Kats are her favorite candy so it was easy to let her choose the surround. For the topping she wanted an M&M mix with plain and peanut. The ribbon was my touch. 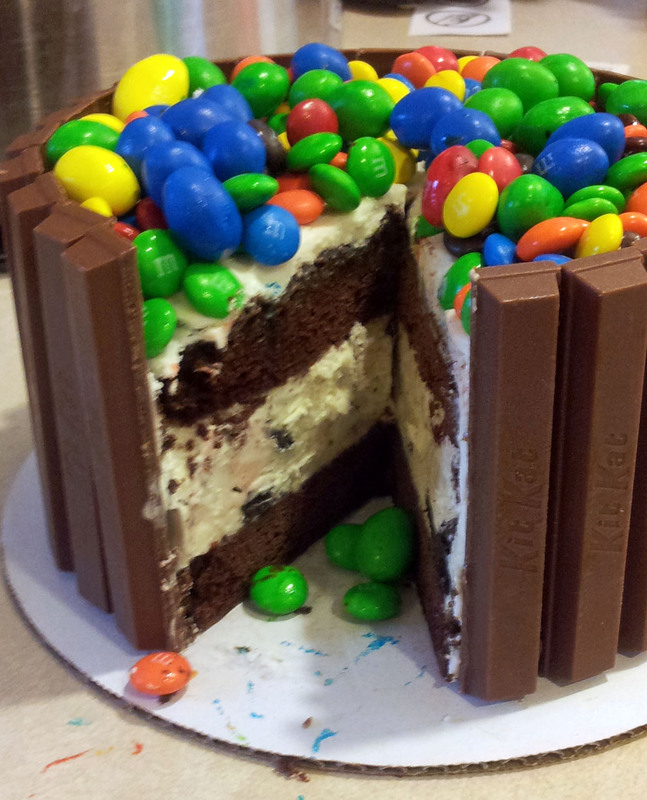 This cake is covered in candy and stuffed with ice cream. 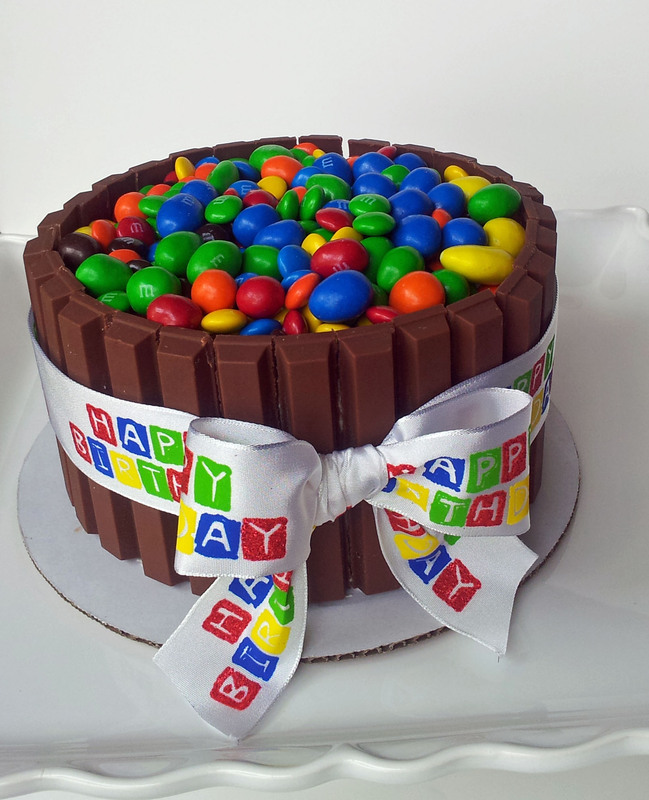 An eight year old’s perfect cake. Hope you like it too. One lesson learned: This would be much less messy if it weren’t an ice cream cake. Once the M&Ms come out of the freezer, the condensation makes their colors run. For us, it added a little more color to our birthday celebration. 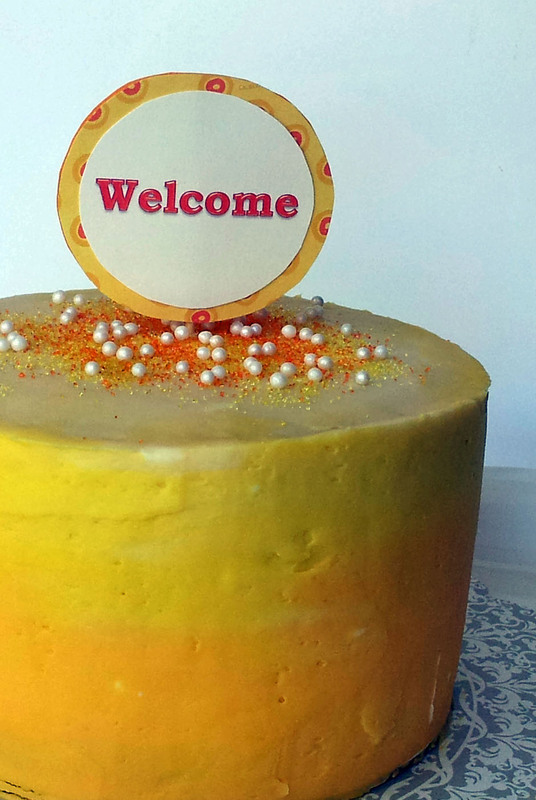 Is there a better way to welcome someone to the neighborhood than with a thoughtful baked treat? I don’t think so. But then again I love baked treats. And honestly, if your new neighbor hates cakes, don’t you want to know it from the beginning? Because really you should consider moving to a more cake friendly environment. This cake is a combination of a couple different techniques. I went with a bright gold to ivory ombre because it compliments the lemon cake and lemon curd filling inside. 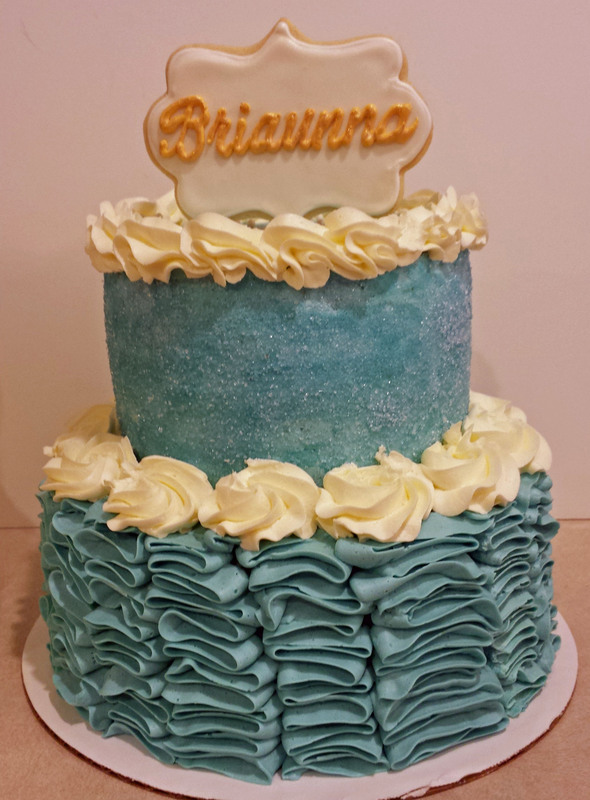 Instead of the ruffle technique, I went with the water color frosting with a more subtle change of shades. The whole thing topped off with some sprinkles and sugar pearls.